Count me as among those who still declare 2000’s Unbreakable M. Night Shyamalan’s finest work — so why aren’t I more excited about Glass, the long-awaited sequel? Part of that is the director’s poor (to be generous) track record of late, but also I never got around to seeing Split, so maybe I’m just not as big a fan as I thought. Regardless, Bruce Willis & Samuel L. Jackson are back as the superpowered arch-nemeses, plus Sarah Paulson as a (temporarily) disbelieving psychologist. This has one of the loonier log-lines of 2019: “A struggling musician realizes he’s the only person on Earth who can remember The Beatles.” Danny Boyle and Richard Curtis (Love, Actually) team up for this fable, starring Himash Patel, Lily James, Kate McKinnon, and Ed Sheeran as [checks notes] himself. So it’s set in the present day, then? Alrighty. Gonna be a lot of Hanks on this list! This time he’s returning to World War II, and to the sea, as the captain of the titular vessel as it dodges pursuit of German U-boats. Aaron Schneider’s first film since 2009’s Get Low. Netflix has picked up this docudrama about the publication of the “Panama Papers,” which revealed how the world’s wealthiest and most powerful covered up financial misdeeds through a tangled web of secret banking accounts. Sounds riveting, right? Well, it’s Steven Soderbergh, with Meryl Streep, Gary Oldman, Antonio Banderas, David Schwimmer, Will Forte, and more. Just don’t expect a satisfying ending, because we’re still waiting. James Mangold (Logan) brings to the screen the story of this real-life racing rivalry — like Ron Howard’s Rush, but more about the cars than the drivers. Tired of losing to the Italians at the annual Le Mans endurance race, Matt Damon leads the team who builds the Ford GT40 in 1966. Christian Bale plays one of the drivers; also includes Caitriona Balfe (Outlander) and Jon Bernthal. Tom Hanks is Mr. Rogers. That’s all you need to know, right? Director Marielle Heller follows Can You Ever Forgive Me? with this biopic, which also stars Matthew Rhys as a skeptical journalist who is won over by the host’s kindness. I hope it’s good; that’s all. New cast members include Patricia Arquette, Key & Peele, Keanu Reeves, and Tony Hale as the plastic spork in the teaser above. It’s longtime Pixar hand Josh Cooley’s directorial debut, from a script by Stephany Folsom (after a draft by Rashida Jones and Will McCormack was controversially discarded). Hanks promises the ending is “a moment in film history,” whatever that means. Based on Patrick Ness’s novel, Tom Holland and Daisy Ridley play colonists on an unexplored planet that gets struck by “The Noise,” which drives many living creatures mad by making them hear and visualize each others’ thoughts. Doug Liman (Edge of Tomorrow) directs, and Charlie Kaufman worked on the script, so you know it’ll be wild. For his fourth film, director J.C. Chandor (Margin Call, A Most Violent Year) collaborates with writer Mark Boal (Hurt Locker, Zero Dark Thirty) on this manly Netflix release. Ben Affleck, Oscar Isaac, Charlie Hunnam, Pedro Pascal, and Garrett Hedlund play former Special Forces operatives who plan a heist against a South American drug lord. What could go wrong? Timmy Chalamet plays Henry V in this Shakespeare reimagining from Animal Kingdom’s David Michôd. Co-written by Joel Edgerton (who plays Falstaff in the mighty footsteps of Orson Welles and Simon Russell Beale, so good luck), the cast also includes Ben Mendelsohn (Henry IV), Robert Pattinson (the Dauphin), Sean Harris (Michael Williams), and whoever else they can cram in while combining the Bard’s three plays into one movie. [whispers] What if it’s good, tho? I recently re-watched the 1997 original with my kids, and I have to say that its puckishness and originality really holds up. (The less said about 2 the better, though I did enjoy 3.) This sequel/expansion/thirst trap will only go as far as Chris Hemsworth and Tessa Thompson’s charisma will take it, which will hopefully be pretty far, because the biggest laugh in this trailer was a reference to Hemsworth’s other gig. Armando Iannucci dove right into this Dickens adaptation after The Death of Stalin. 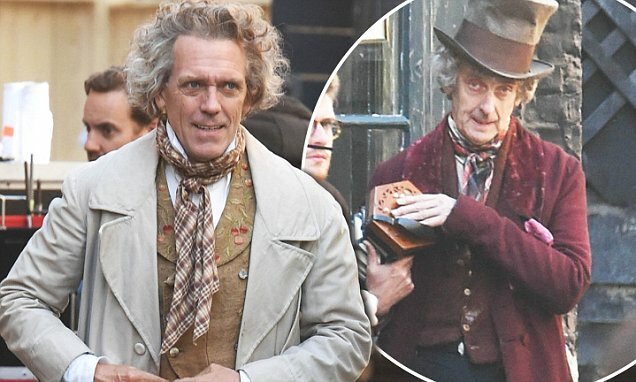 It was announced as a “modern retelling,” but the set photos (behold, a hilarious-looking Peter Capaldi and Hugh Laurie) are pure Victorian — though “playing it straight” is not in the Veep creator’s vocabulary. The exciting cast also includes Ben Whishaw, Tilda Swinton, Gwendoline Christie, and Dev Patel as Copperfield. Disney really wants you to know, despite this trailer, that the new Lion King is NOT a “shot-for-shot” remake. The highest-profile of the studio’s 2019 live-action-ish onslaught — after Guy Ritchie’s Aladdin and Tim Burton’s Dumbo — this King is sure to make a billion dollars just with Beyoncé’s name in the (mighty impressive) cast alone. But I am curious to see what Jon Favreau brings to it that’s new, because his Jungle Book was surprisingly good. Otherwise, I don’t know why this needs to exist at all. Everyone wanted to know what Greta Gerwig would pick as her follow-up to Lady Bird; I don’t know anyone who wasn’t surprised she picked Little Women, one of the most-adapted novels basically ever. Nevertheless, with the insightful Gerwig at the helm and an all-star cast of Saoirse Ronan, Emma Watson, Florence Pugh, Meryl Streep, Laura Dern, Bob Odenkirk, and Timmy Chalamet (again), there’s no reason why this can’t end up as the defining version. You may or may not remember the story of astronaut Lisa Nowak, who infamously wore diapers on a non-stop drive from Houston to Orlando to kidnap (and possibly kill) the new girlfriend of another astronaut she had already had an affair with. It took me ten minutes to write that sentence, because it’s still confusing as heck, with the details disputed. Anyway, Noah Hawley (Fargo, Legion), whose name attached to anything gets my attention, makes his feature directorial debut with Lucy in the Sky. It stars Natalie Portman as a fictionalized version of Nowak who has cracked after a long space mission, Jon Hamm as the other man, Zazie Beets (Atlanta) as the other woman, and Dan Stevens as Lucy’s husband. The Irishman was first announced as Martin Scorsese’s next film back in 2008, and then almost immediately went into limbo after a conga line of script and funding disputes. It was finally ready to roll in 2016, but after Silence bombed (a masterpiece, to be clear), no one wanted to finance what would become Scorsese’s most expensive film ever… except Netflix. Why is a ’70s-set mob movie so expensive, you might ask? Because of the de-aging special effects being done on Robert de Niro as corrupt union official/hitman Frank Sheeran, and Al Pacino (who is working with Scorsese for the first time, believe it or not) as Jimmy Hoffa, whose disappearance is the stuff of legend. Whatever the result will be, it’ll have been over a decade in the making. Taika Waititi’s follow-up to Thor: Ragnarok ought to have you in the theater with no additional information, but what if I told you that it was about a young German boy during World War II who desperately wants to join the Gestapo, and fantasizes an imaginary friend in the form of Hitler himself, played by Waititi? Would you still want to see it then? Of course you would. The cast also includes Sam Rockwell, Scarlett Johansson, Stephen Merchant, and Thomasin McKenzie as the hidden Jewish girl who turns Jojo’s world upside-down. What Quentin Tarantino claims will be his penultimate film is at least story-adjacent to the lurid Manson family murders, with Margot Robbie as Sharon Tate. Meanwhile, or should I say primarily, Leonardo diCaprio and Brad Pitt play a struggling actor and his stunt double, respectively. The sprawling ensemble also includes Damien Lewis, Dakota Fanning, Luke Perry, Al Pacino, Scoot McNairy, Lena Dunham, and many of QT’s usual players in unspecified roles. It’s taken me this long to get to a comic book film, but it’s not from lack of options. You’ll certainly see Wonder Woman 1984, Spider-Man: Far From Home, Dark Phoenix, and others I note in the “ALSO” section below on many “Most Anticipated” lists, but I limited the field to the two that I’m already committed to on opening night: My obvious #1, and Captain Marvel. I’m not especially steeped in the lore so I can’t say I know what to expect (that’s for Manu or Brian to tell you), but I’ve been a massive Brie Larson fan since Short Term 12 and I’m so excited to see her get her shot at leading a blockbuster — especially one so critical to pointing the way forward in a post-Avengers landscape. More Lee Pace and Jude Law is a good thing, too. Jordan Peele’s second film after the smashingly successful, shoulda-been-Best-Picture Get Out looks legitimately terrifying. Peele says his new “monster mythology” isn’t specifically about race, though it was imperative he set a black nuclear family unit at its center; even so, this nightmarish trailer leaves us with a lot to unpack. It’s going be a massive year for Jordan Peele, and I am here for it. James Gray made one of 2016’s best with the criminally under-appreciated The Lost City of Z, and returns this year with a space-set drama starring Brad Pitt as an astronaut searching for his father (Tommy Lee Jones) on the edges of the solar system. Because it’s Gray, you know it will be meditative and beautiful — Interstellar, but perhaps without the bookshelves. I would die for Rian Johnson. The Brick, Breaking Bad and The Last Jedi director has had a rough go of it since the release of Episode VIII, with fanboys descending like gargoyles to threaten him with unspeakable acts for, I guess, making a really good and surprising Star Wars film. But rather than going into exile, Johnson is coming back in 2019 with a “whodunit”-style murder mystery starring Daniel Craig, Chris Evans, Lakeith Stanfield, Michael Shannon, Toni Collette, and a bunch of other cool people. I’m way, way in. Oh, speaking of Star Wars…I guess you heard we’re getting another one this year? J.J. Abrams returns to the director’s chair for Episode IX, which you can expect will be the dramatic and exciting conclusion of the Rey/Kylo Ren/Finn/Poe/BB-8 saga. Perhaps the most-discussed question, however, is how Abrams and co-writer Chris Terrio will handle the passing of Carrie Fisher — evidently there are some deleted scenes that will be integrated, and her family is satisfied with the results. (New cast members include Keri Russell, Matt Smith, and Richard E. Grant.) Where Star Wars goes from here is anybody’s guess, with Rian Johnson, David Benioff & D.B. Weiss, and Jon Favreau (see next page) all developing new stories, but fingers crossed that this third trilogy goes out on an Anakin’s Ghost-free high. The remaining Avengers deal with the fallout of the great Snappening, and some of them might die for real. It’s the end of an era in the Marvel Cinematic Universe. Don’t lie and say you won’t be there to see it. ALSO: Joe Cornish follows up 2011’s Attack the Block with The Kid Who Would Be King…Richard Linklater teams with Cate Blanchett for Where’d You Go, Bernadette…Will Smith fights his clone in Ang Lee’s Gemini Man…David Harbour is Hellboy, Zachary Levi is Shazam, and Joaquin Phoenix is Joker…There’s a Downton Abbey movie…LeBron James fulfills his destiny by starring in Space Jam 2…musical lovers get both Wicked AND Cats…plus Godzilla 2, It 2, The LEGO Movie 2, Frozen 2, How to Train Your Dragon 3, John Wick 3, and other stuff you’re probably mad I didn’t mention.